by Joanne Ivancic (Advanced Biofuels USA) He was dressed like an executive; dark suit, white shirt, tie, and struggling to get a poster board out of the back of an SUV as his mother tried to help. I glanced the word “Bio diesel” on the poster and approached the two. 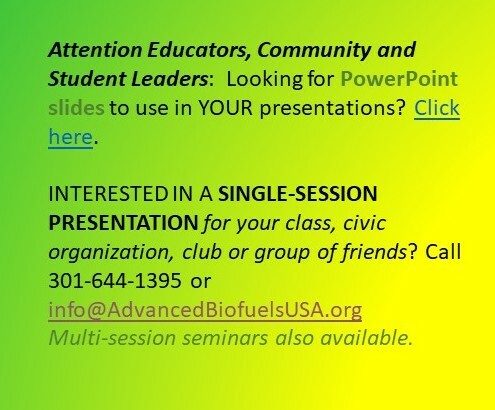 I offered my card to the mother, as the young man had his hands quite full, and told them Advanced Biofuels USA had an exhibit table at the EnergyPath conference, they might want to stop by or to check out our web site. I planned to stop by the poster session to see his project. Science Fair students explain their projects to judges and EnergyPath 2012 attendees. The night before the DeSales University cafeteria was re-arranged to accommodate the student science fair portion of the EnergyPath 2012 conference. I was curious to see what the students would come up with. The conference was tilted heavily toward wind and solar with some geothermal thrown in; and substantial attention to sustainability overall. 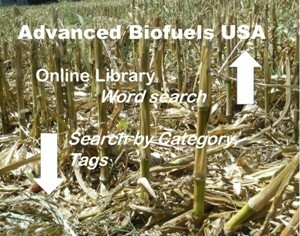 I was pleased to see four posters dedicated to biofuels-related topics. Here are their stories. Stephen DeLucca of Fort Washington, Pennsylvania did the biodiesel research. A student at Germantown Academy starting his senior year in the fall, he said he wanted to do a chemistry project and, talking with teachers about options chose the topic, “Which Waste Oil Produces the Purest Bio diesel.” I wasn’t really sure from the title what he was getting at, so we had a good talk about it. Stephen DeLucca explains his study of oil feedstock for biodiesel. All the students in the EnergyPath Science Fair were expected to prepare a 3-10 minute speech about their projects, in addition to creating a poster board. They would meet with judges to explain their projects; and were expected to be available at their poster for a couple of hours to discuss their projects with conference attendees. In addtion, they could bring small scale tangible projects to demonstrate their research or design. Stephen started in on his speech, but I really didn’t want to hear it. I’m not a scientist and didn’t care so much about the formalities. I was more intrigued by the background stories. Stephen chose five different oils. He used pure vegetable oil (unspecified vegetable) right out of the bottle as the benchmark. He compared it to four waste oils that he created by frying potatoes in the various oils (coconut, peanut, sesame and corn). I asked about the sesame oil. Pretty expensive. His teacher contributed his supply. We discussed his choice not to use palm oil. He didn’t know to think about it. He didn’t know about the role that palm oil plays in the world biodiesel market. Such knowledge might have influenced his choice of oils. That lead to us to talking about the controversies surrounding feedstocks such as palm oil and, with a nod to the price of sesame oil, to the economic element in the sustainability equation. Back to the details of the project. More than the value of his results, I believe, was the value of the process. He could describe the lab techniques that he learned and used. 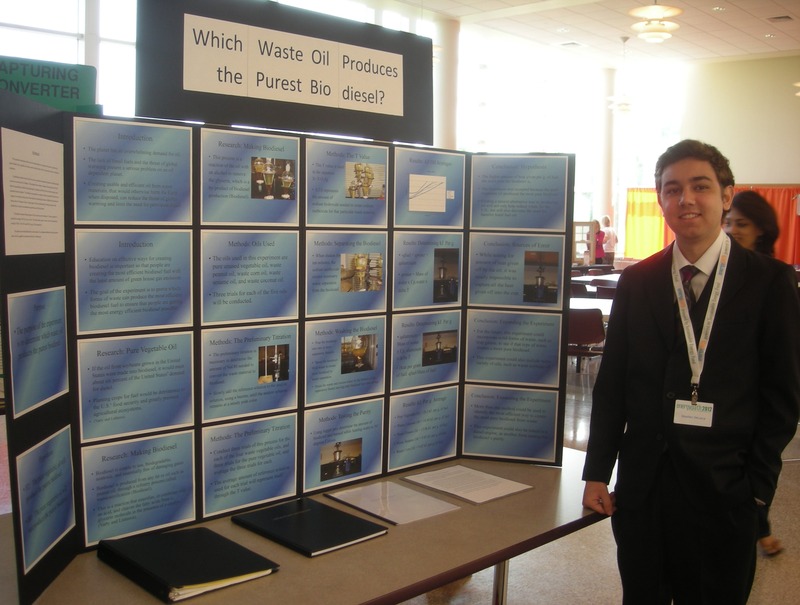 He learned to make biodiesel from five different oils and observed differences. He identified weaknesses of his original plan for conducting his experiment and designed innovations to address those weaknesses and to improve the quality of his results. Also, as so often happens, mid-course corrections were needed as unforeseen consequences arose. Recognizing that the soot that built up on the vessel of water might affect his results added a new step to his process. 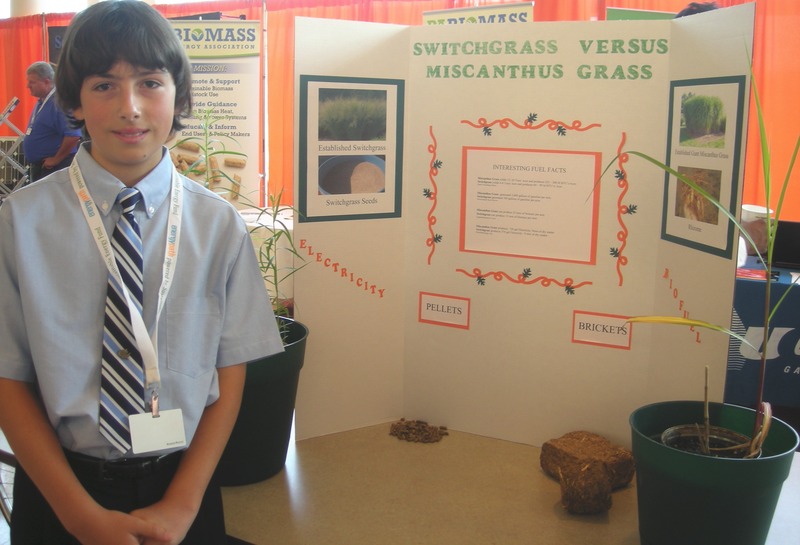 7th grader Josh Danna with his switchgrass vs. miscanthus project. I enjoyed hearing his story as it capsulized in miniature the experiences I hear of advanced biofuels companies moving from bench to pilot to demo to commercial. Doing something you’ve never done before, not giving up, figuring it out and becoming inspired to continue. Stephen is interning in a chemistry lab this summer and looks forward to more science classes and to a career in this field. Josh Danna, a 7th grader at North Pocono Middle School in Moscow, Pennsylvania, received a lot of help from an aunt. She introduced him to miscanthus and switchgrass. His project focused on literature research comparing yields per acre and amount of fuel that could be produced per acre. He came out in favor of miscanthus over switchgrass. An enzymatic biofuel cell project with researcher Achille Tenkiang. 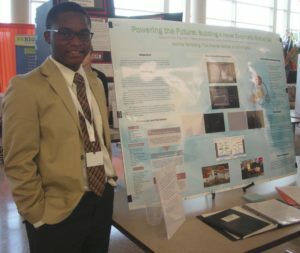 Achille Tenkiang became inspired to do research on fuel cells using renewables as a result of a trip with his parents to their home country of Cameroon when he was in the 8th grade. Now, between his junior and senior years at Charter School Wilmington, Delaware, he presented research on “Powering the Future: Building a Novel Enzymatic Biofuel Cell.” Wow! Achille may be a teacher some day. This project was so over my head. It was like reading scientific articles where I know it is written in English, but beyond words like “the,” “and” and “enzyme,” I’m lost. Achille quite patiently walked me through, answered my questions and engaged my interest and attention. My impression was that his research was in the same ballpark as that done on fuel cells in St. Louis some years ago; research that foundered as funding diminished. I hope his work revitalizes interest in this area. Achille said that he has been working on a biofuel fuel cell idea for three years with last year’s project focused on micro-organisms rather than enzymes. I asked about his future plans. He looked a bit sheepish and said, “Yes, I should be thinking about that.” He seemed more interested in actually doing research in the lab at a university five minutes from his home than doing anything else. I got the sense that he was more interested in making something real happen than getting a piece of paper indicating an academic degree. Rachel Zuckerman looks to the future of mold-derived enzymes. The dearth of intense plant cell research has been lamented at the Advanced Biofuels USA offices. 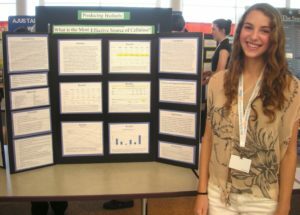 Rachel Zuckerman of Springside Chestnut Hill Academy in Philadelphia, Pennsylvania may be one to work on turning that around if she continues research in the area she showcased at EnergyPath 2012. Her subject, “Producing Biofuels: What Is the Most Effective Source of Cellulase?” grew from her understanding that biofuels can help to mitigate the destruction of climate change. She tested four kinds of mushrooms and two molds to determine if the source of the enzymes made a difference in their effectiveness in breaking down cellulose. The four kinds of mushrooms came from a local grocery store. She grew the two types of mold in a drawer in her refrigerator. That has got to be my favorite part. How often we joke that the leftovers hiding in the back of that vegetable bin are “science projects.” At her house, it was true. And, one of those molds beat out the other sources of cellulase significantly. Reminded me of the story of the discovery of penicillin. Again, the journey through this project taught her lab technique and exercised her observational skills. 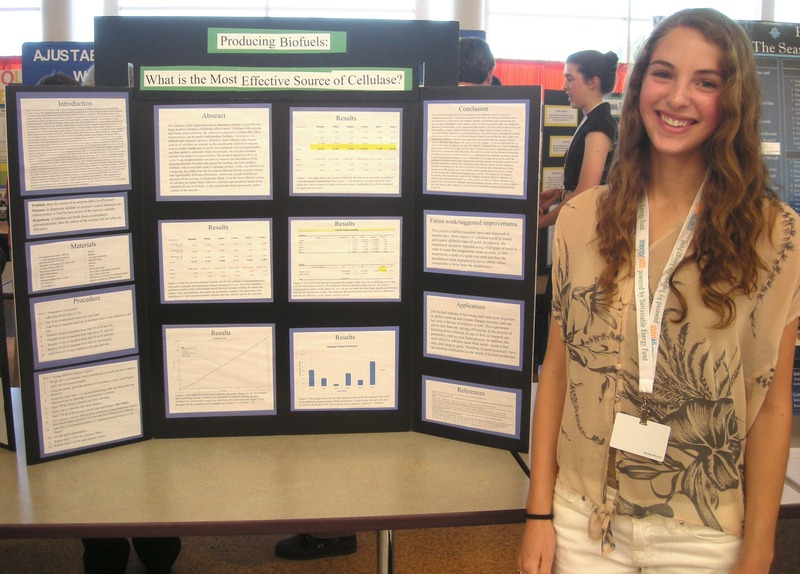 As with the other students, her conclusion looks to the wider world and the future, “This experiment shows that there are varying efficiencies in the process of breaking down cellulose for use in fuel, so research can potentially yield an even faster process. 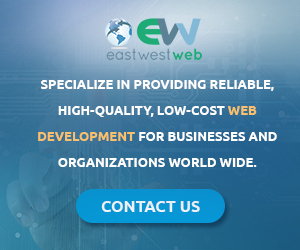 In addition, the most effective cellulase came from mold–mold is fast, easy and cheap to grow. 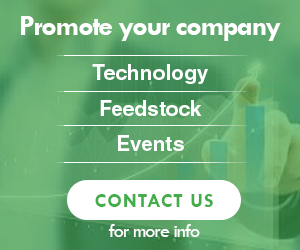 Therefore, it could have far-reaching implications in the world of biofuel production.” There are some well-funded companies that have reached similar conclusions. Perhaps they will find Rachel in their future.